But my fellow vegans, fear not! As a curious vegan tourist who is passionate about healthy food, I have gone all over the city trying out different vegan restaurants and came back with a list of awesome places that could fill a whole week of dining out with no repeats. Are you ready for the magic? Here we go! Are you wondering why the first option isn’t in El Poblado? 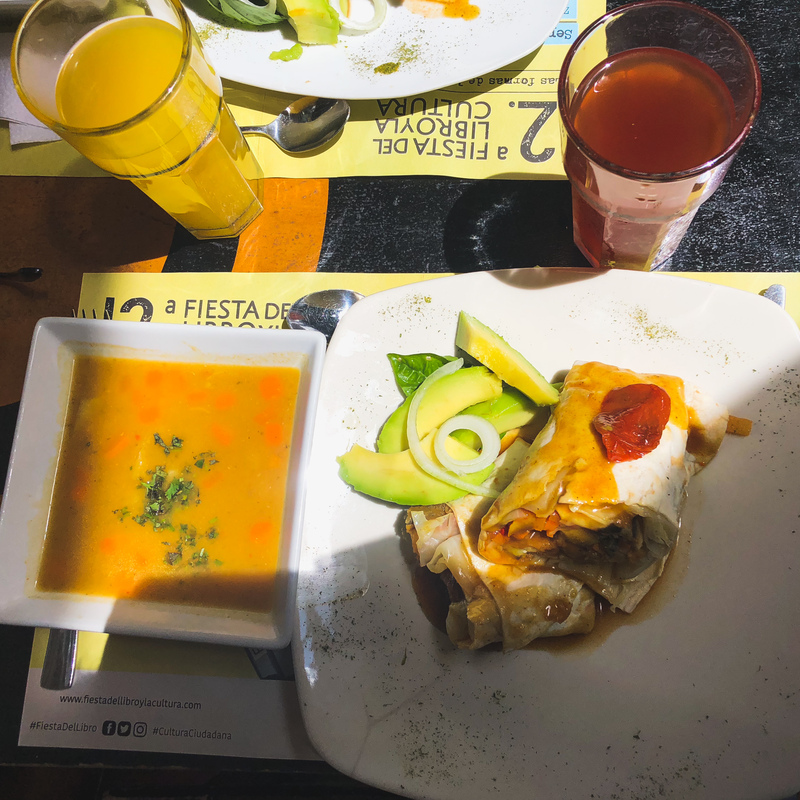 The reason is after many tries, Govinda’s proved itself to be the best vegan restaurant in Medellin for the budget-friendly, high quality, diverse, and healthy options it offers. For just 10,000cop, you can have a well-balanced vegan/vegetarian meal. Since Govinda’s sits on the second floor in the centro area, it is worth spending some time sitting by the window and looking out into the infamous “Red Light Zone” right in front of the church. 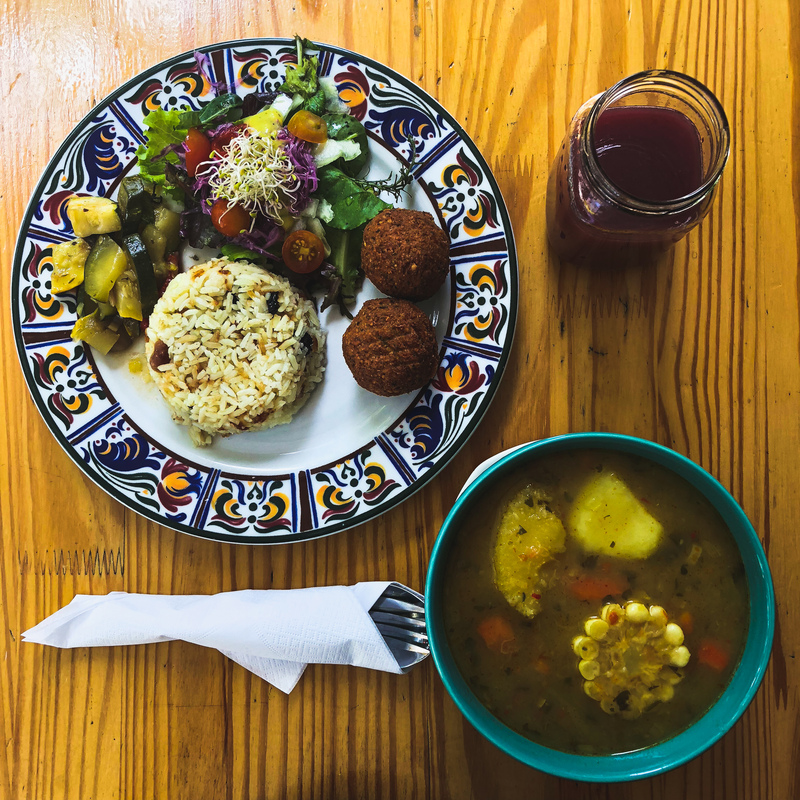 Besides El Menu Del Dia, Govinda’s also offers a good selection of vegan-friendly signature Medellin food, including empanadas, pasteles de papa, carrot cakes etc.) 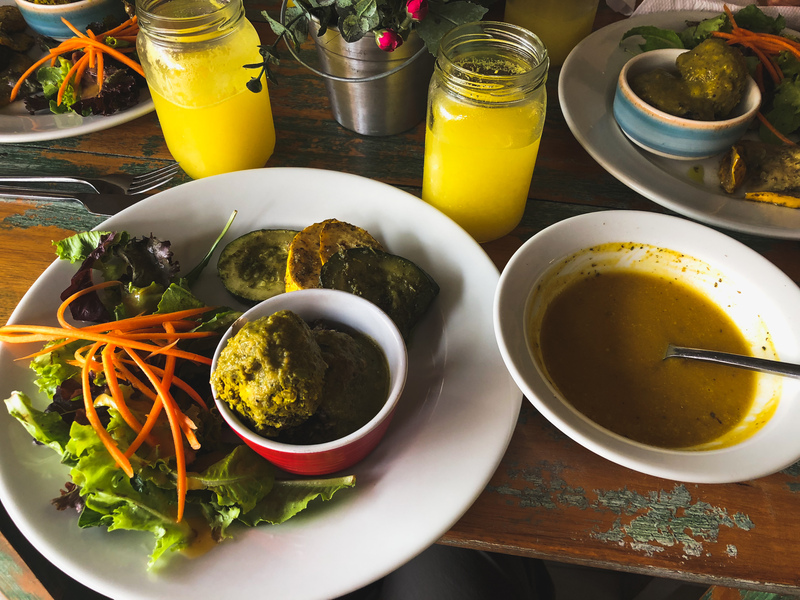 If you want to experience how Medellín locals live a healthy vegan/vegetarian lifestyle, Govinda’s is a must-go! If you are dining out as a vegan around El Poblado, this restaurant is my first recommendation. Comparing to the other restaurant, their price is slightly cheaper and their food is delicious. They included microgreens in the salad and their juice (jugo de mora) was exceptional! 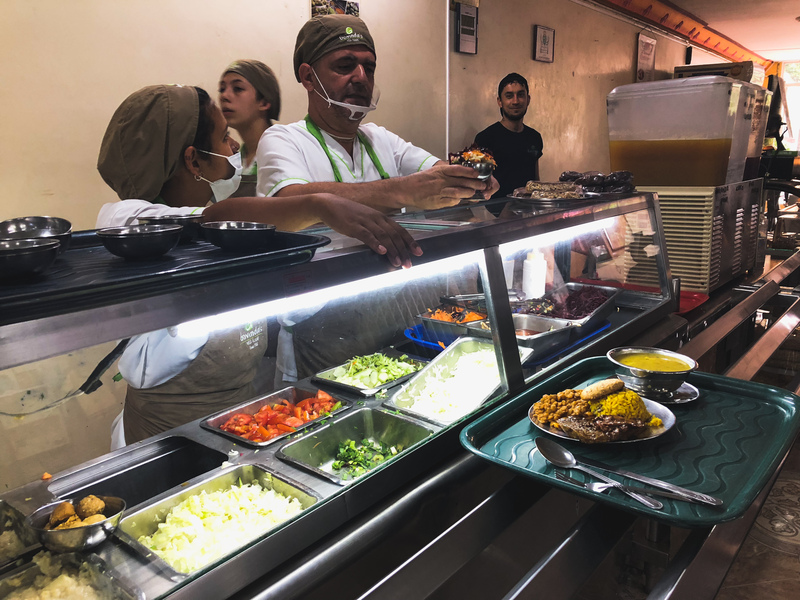 Know that they only have 8 tables in total, and they are usually completely filled during regular meal time, so you may want to avoid traffic time to enjoy their atmosphere. If you are sick of the El Menu del Día style or simply craving some awesome vegan burger, Lenteja Express is there for you! Rather than the menu of the day, this restaurant offers a variety of burgers, pasta, and even Nachos(!) for you to freely order and combine. 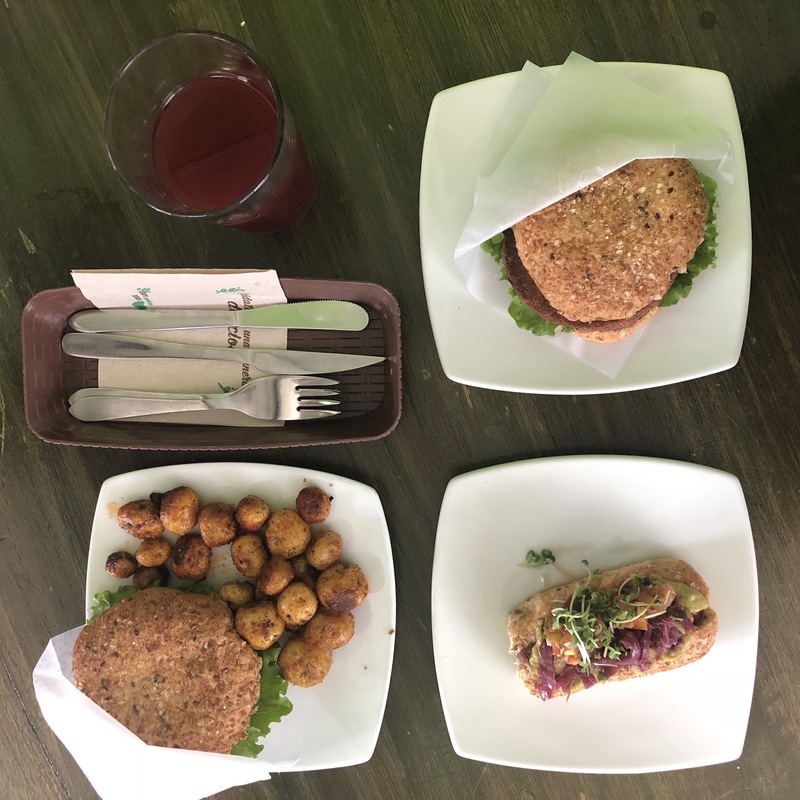 After having El Menu del Día for over a month, it is just lovely to sit down and enjoy a healthy, tasty vegan burger in a rainy, stormy Medellín afternoon! Agreed? 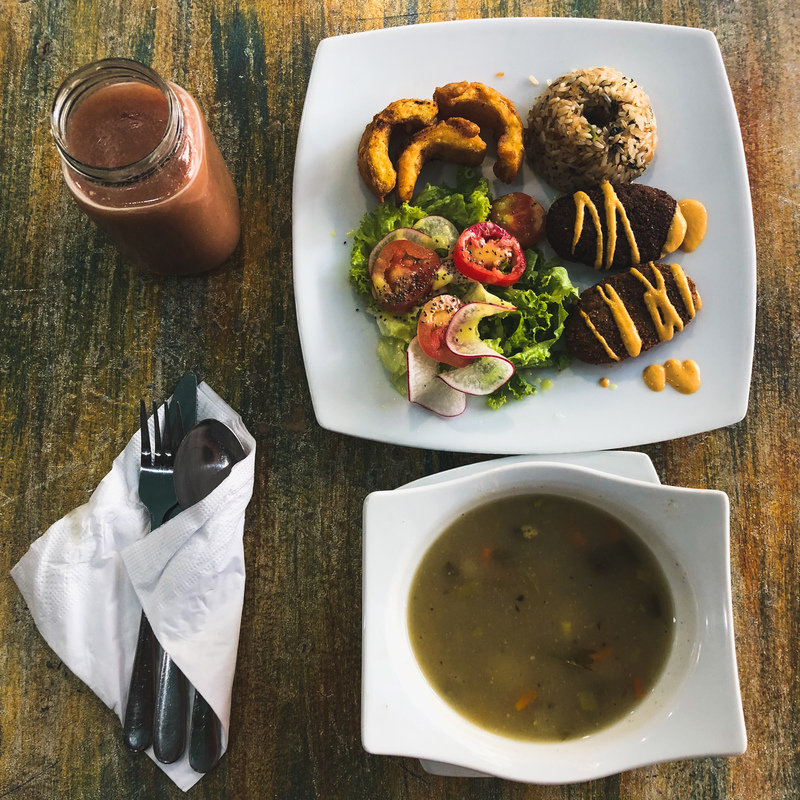 This is one of the most famous vegan restaurants in the El Poblado area. They have bilingual waiters and they are very friendly. While their service is great, I found their salad mediocre (the salad was not very fresh) and the combo I had to be not as filling as other restaurants. 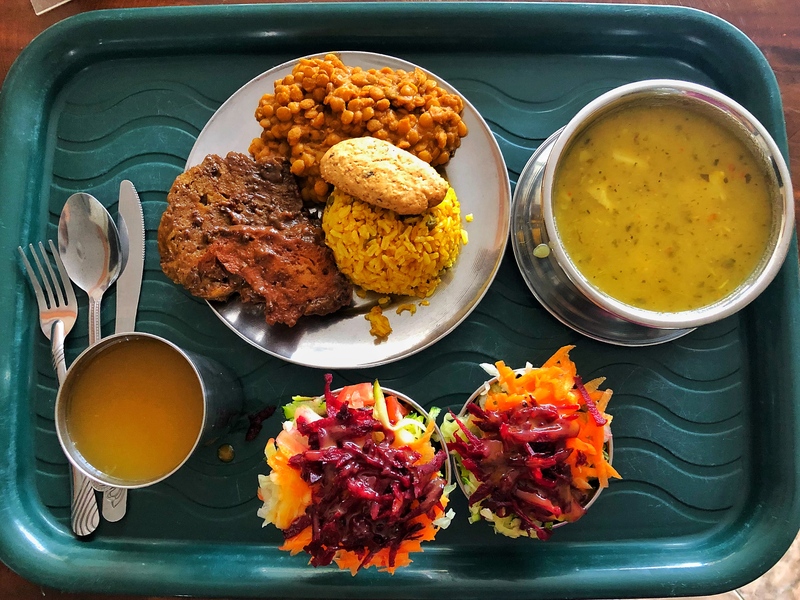 But if you are just looking for a quick bite of vegan food around the block, Dharma could serve you just fine! I had the worst experience dining at this restaurant. The food tasted ok, but when I was checking out, the waitress charged me 16k and later on explained that she included servicio (tips/service fee). While the food or service was not exceptional, it was slightly irritating for me to be involuntarily charged more than what was written on the menu board outside of the restaurant. As I moved to different Airbnb, I came across this gem close by Laureles. While I don’t think the photo did Vegarden justice, I will say that this is one of the few vegan restaurants that offer dessert in their Menu Del Dia (the other one is Govinda’s.) Their food was so good that I returned for more than twice! Since this restaurant locates in a nice and quiet neighborhood and provides an outdoor area with good wifi connection, I think this is the best place to sit in for a while and chat with a friend after enjoying their delicious meal! As a bonus point of today, here are some other great options that are recommended by many (including our 7in7ers)! Please feel free to check them out and comment below about your experience!